The much awaited festival of the Mizos, Chapchar Kut will be held on March 1 and 2. Meanwhile, preparations are in full swing for the grand celebration. 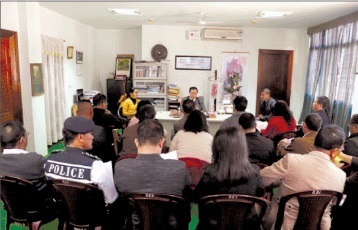 A meeting of the organizing committee on the preparation of the festival was held at Aizawl on Friday where the co-chairman of Chapchar Kut Organizing Committee and State Revenue and Culture Minister R Romawia said this year the festival will be held under the theme – Sem sem dam dam ei bi thi thi – a Mizo proverb on ‘sharing’. The meeting held at the Minister’s official chamber also decided to celebrate the festival in a grand way. According to the organizing committee, Chapchar Kut will be celebrated across the State and the grand celebration will be organized at the Aizawl Assam Rifles Ground in the capital city. Notably, the celebration will be graced by the Chief Minister of Chin state in Myanmar, Sailai Lianluai on the second day. All the ministers of the Mizoram cabinet will also be present in the celebration. The meeting also decided that no-vehicle zone will be created during the festival and free parking will be provided to the people attending the festival. The meeting also deliberated on promoting the festival through billboards, hoardings, etc. The organizers have also urged the people of the State to wear traditional dresses during the whole week of Chapchar Kut. A phot exhibition will also be held as part of the celebration at Vanapa Hall while handloom and handicraft exhibition will be held at the AR Ground volley ball court. A food court will also be set up at the venue of the main celebration.